Songea (Agenzia Fides) - A Brazilian ethnic Guarani professor will teach the youth and adults of the area of Songea in Tanzania, the techniques of organic farming, in the spirit of Laudato Sì. Thus a cooperation project is carried out between two countries in the South of the world promoted by the Missionary Sisters of St Joseph of Chambery, in collaboration with the Italian NGO "Cose". Although Tanzania is one of the most dynamic African countries rich in natural resources and food, it has to deal with very widespread poverty (70% of the population live on less than two euros a day). 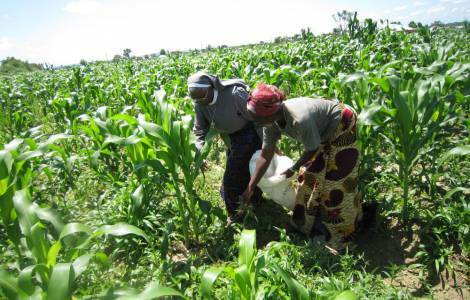 The agricultural sector (23.4% of GDP and 66.9% of the Tanzanian workforce) is the driving force to alleviate poverty and improve the living conditions of small farmers. Most farmers are limited to producing coffee, corn, cassava, bananas and a few other agricultural products, as well as breeding sheep and goats. However, techniques that increase productivity and quality are not widespread. The crops are then exposed to diseases, fungi and insects that are fought with chemical preparations, which are very expensive. "In the spirit of missionary cooperation, we have decided to help the peasants and their families - explains Sister Josiane Mota Coelho - introducing forms of cultivation based on biological methods.The advantage is twofold: one should not spend to buy chemical preparations, and respect nature. We therefore turned to our Brazilian sisters who know the problem and a South-South biological cooperation project was born", formulated following the spirit of Laudato Sì: helping development and agricultural work, it contributes to the wellbeing of a whole family, with positive effects, on women, on children, on the path of education. In the diocese of Songea there is already a Center of Education for sustainable agriculture, founded in 2008. Here we teach the techniques of agriculture and sustainable farming through quality courses, research, advice and community service, in an activity that is pastoral, before being social and economic. In this center, Nilton Ferreria Lima, a Brazilian biologist, has been invited to collaborate with the Unidade Experimental Center Poty Reno in Caarapò. "Thanks to him - explains Sister Josiane - we learn techniques that increase productivity and quality of products and improve our health through the consumption of natural food while at the same time stopping the state of degradation and loss of fertility of the soil caused by traditional crops and monocultures".